Last year, My Son Trent wanted to be Mr. Freeze from a Batman video game. We went all out! We made a really cool costume and submitted him in a costume contest at a local television station in North Carolina...and he won. He said he wanted to do this contest again this year and wanted to be a dinosaur. So I had to get creative and figure out how to make a dinosaur. I ended up making 2. The company Flex Seal heard about it and gave us a few cans of their product to seal the foam "skin". But because of the weight added from numerous cans of paint, we ran into the problem of it weighing too much for my little 7 year old to walk around in. So we had to peel it off and start over. So when you see the pics and see the youtube video and it looks a little different, its because we had to peel the skin off and start over. I made him a little velociraptor and me a juvenile T-Rex. 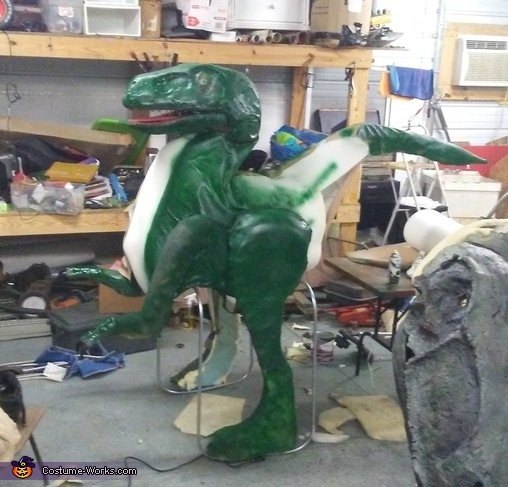 Attached is a few pics of the dino and a few youtube videos we made of the construction. I will submit both costumes. His and Mine. My son's costume is a little cartoonish, but the big dinosaur looks scary real. make sure you check it out!